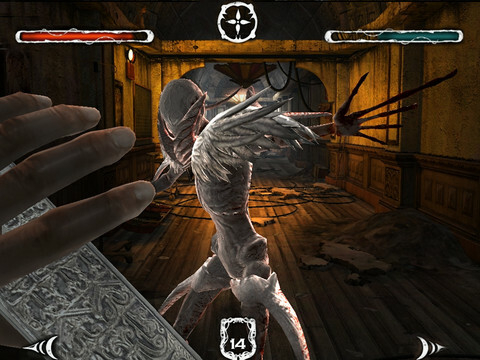 Dark Meadow is a first-person game for iOS (iPhone, iPad, iPod touch) that mixes RPG and action elements. The app starts with you, the protagonist, waking up in a dilapidated hospital. Your character is unsure of how he got there, and is warned of a witch who roams the halls. From there, your quest begins. You start exploring the hospital, fighting different monsters and piecing together clues to figure out what is going on. Read on to learn more about how it holds up. Let’s start with the controls. 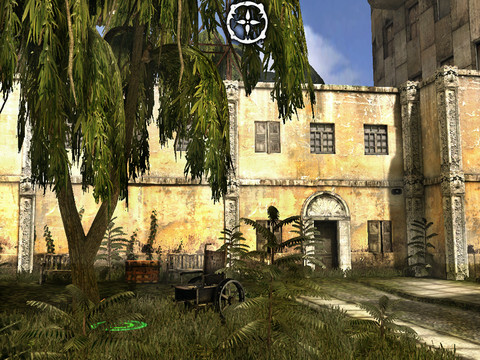 Given the fact that Dark Meadow is a first-person experience on a touch device, I was a little weary. I’ve play FPS games on both iOS and Android devices that were simply unplayable. They use touch buttons and touch control sticks that just don’t work well because you can’t actually feel them. I was relieved to find out that Dark Meadow is 100% different. Instead of relying solely on on-screen buttons, Dark Meadow uses gesture controls. You swipe the screen to look around, pulling your view to where you need it to be. Movement is based on tapping different areas; you’ll see an area highlighted and touch that spot to move. To walk through a door, you tap the door. To walk through a room, you tap on areas of the floor. It’s a very effective control scheme. While it wouldn’t be completely practical in a faster-paced environment, Dark Meadow is moderately paced and the controls works great. A great control scheme would be worthless if Dark Meadow was ugly to look at. Dark Meadow is one of the prettiest games you’ll find on iOS or any other mobile platform. I was playing the app on an iPhone 4, so maybe the graphics take a slight downgrade if you play on the iPad ‘s larger screen. But I was very impressed with my experience. Both the enemies and environments have a lot of detail. The walls, for example, have a perceptible level of dirt and grime on them to really reinforce the fact that you’re in a spooky, run-down hospital. The enemies have enough detail to be convincing as well. Overall, it looks real enough to capture your imagination, and that’s what really counts. I have few complaints to offer. The battles early on can be a little tedious, since you’re just shooting enemies with your crossbow and ducking their attacks. When you progress through and start having battles with larger enemies, there are melee battles that bring more of a sense of urgency. Some players have complained of their being only one spawn point after you die. I didn’t have a problem with this, but maybe I just have ventured far enough through the game ‘s story. The bottom line of all of this is that Dark Meadow is a fantastic application . The playing experience is fluid, and the story gives you just enough to make you want to keep playing and finding out more. At $5.99, it costs more than a lot of apps, but Dark Meadow is worth the money more than any iPhone app. Available in the app store, it’s a great value for anyone who enjoys gaming on their iPad , iPhone or iPod Touch. AppSafari review of Dark Meadow was written by Joe Seifi on November 3rd, 2011 and categorized under Action, Adventure, App Store, Featured, First Person Shooter, Games, iPad apps, Universal. Page viewed 4669 times, 7 so far today. Need help on using these apps? Please read the Help Page.